Israel has been a senior and proud member of the global ad-tech scene form the industry’s earliest days. 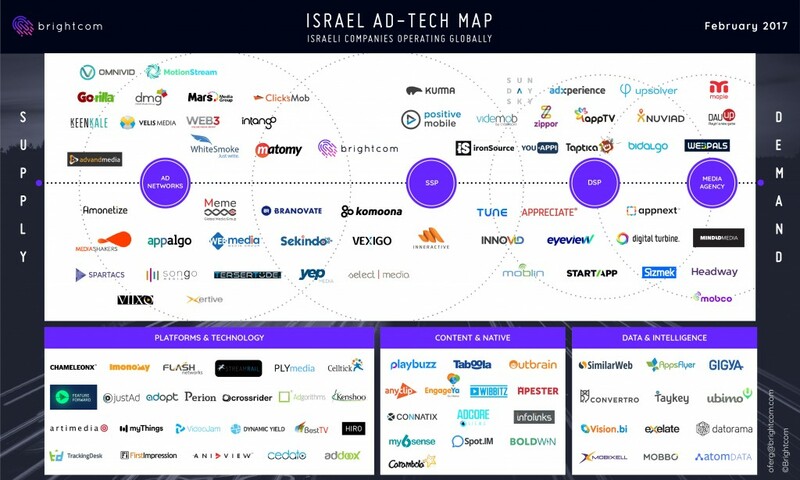 It is estimated that 25 percent of the overall ad-tech activity that is not Facebook or Google is managed by Israelis (although Facebook and Google do have two large centers based in Israel). As the local-to-global industry matured, it created a wide range of companies, from international and established ones to groundbreaking small ones, and everything in between. Brightcom has taken it upon itself to create a map of the Israeli industry. In order to get an the bird’s eye view on the industry, every company has been positioned once according to its core activity. Only global companies that have significant operations in Israel have been chosen for the map (although in some cases, the company ownership is no longer in Israel as a result of investments, mergers and acquisitions). We’ve done our best in order to create a clear and detailed picture, and we intend to update the map every few months. For any questions about this subject or offers, you are welcome to contact us through our website. Cool map. What about TUNE ? We updated the map with Tune. We added VideoJam.tv logo. It will be out in February edition. It’s appropriate time to make some plans for the future and it is time to be happy. I’ve read this post and if I could I desire to suggest you few interesting things or sugigsteons. Maybe you could write next articles referring to this article. I wish to read even more things about it!